An Amuse Bouche is a flavorful, bite-sized appetizer that “entertains the mouth” as it awaits the main event. Set out dishes of assorted olives and nuts, and no one will complain, but roasting the olives makes them slightly chewy and concentrates the flavors in a way that is guaranteed to keep your bouche amused. Serve them solo with skewers for spearing or with low-carb crackers or Parmesan Fricos. 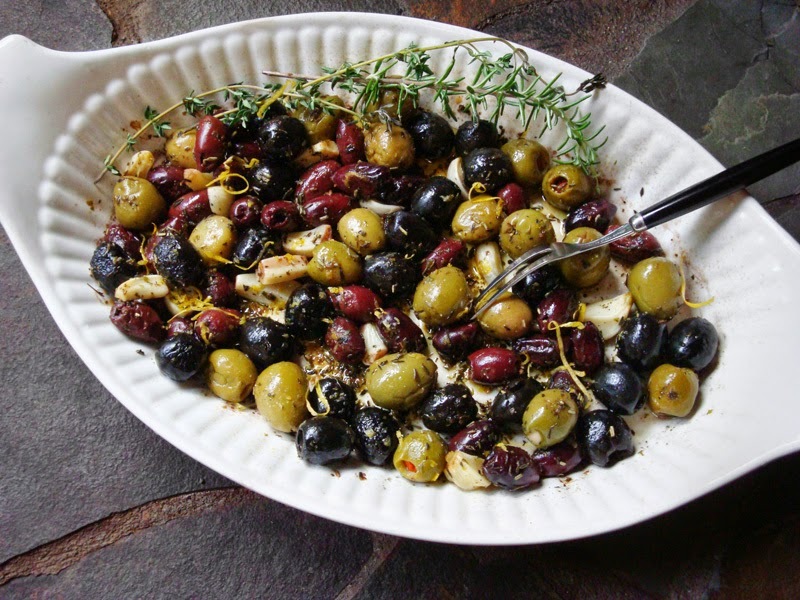 Drain olives and place on a small, rimmed baking sheet with the garlic, Herbes de Provence, and olive oil. Toss together until well mixed. Bake for about 20 to 25 minutes, or until olives are sizzling and garlic is starting to brown, stirring after first 10 minutes. Cool on pan until just warm. Transfer to a bowl, grind fresh black pepper and grate fresh lemon zest over olives and toss. Garnish with sprigs of fresh herbs, if desired. Serve warm or at room temperature. Herbes de Provence (Provençal herbs) is an aromatic seasoning blend made form the plants that thrive on the rocky, sun-drenched, hillsides of Southern France. You can make your own custom mix using some or all of the following dried herbs listed below. ½ teaspoon each of oregano, mint, bay leaves, basil, fennel seeds, rubbed sage, and orange zest. Makes about 1/3 cup, ground. Herbes de Probence. Herb Blend, Olives. Bookmark.